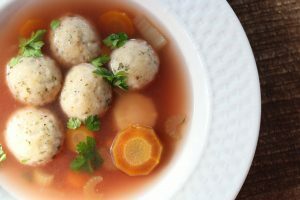 In the process of writing my first vegan cookbook “Oy Vey Vegan,” I recreated the traditional matzo ball soup. I couldn’t be happier with the result. The texture is somewhere between kneidlach and gnocchi, which I love! It melts in your mouth, and the flavor / spices are perfectly seasoned and decadent. Create balls from the dough, and cook them in the boiling soup. When they float they’re ready. Growing up in a Jewish home means eating chopped liver or pate during every holiday! The taste of chopped liver is very distinct. The main ingredient in chopped liver, besides liver, is onion. The onion basically creates a yummy sweet flavor, and you will not believe how easy it is to make a vegan alternative to chopped liver. The version that I’m making has no aftertaste versus eating real liver. The crunchiness from the walnuts with the sweetness of the sautéed onions combined with the creaminess of the beans, produces a perfect delicious vegan pate. It is so much better for your body than real liver and it’s packed with proteins and vitamins. It is great appetizer, it’s elegant, and gourmet. In a nonstick pan on low heat add 1 tablespoon olive oil, onion, salt and pepper. Sauté until translucent. Pour onion mixture into the food processor, add beans, walnuts, 1 tablespoon of olive oil and cognac, Pulse until you get pate-like smooth consistency. Spread on crackers, toast, matzo or on slices of peppers and serve in room temperature.